Thank you to Anne Elliott (annkelliott@Flickr) for today’s image of Jatropha gossypiifolia, contributed via the Botany Photo of the Day Flickr Pool. Jatropha gossypiifolia (commonly known as belly-ache bush) is a member of the Euphorbiaceae. It is native to New World tropical and subtropical regions from Mexico south to Paraguay, as well as many of the islands in the Caribbean. It is a large shrub or smaller short-lived tree, usually reaching heights of around 3.5 to 4.5 metres (8-15 ft.). The leaves are glossy with 3-5 lobes, and range from dark green to brick-red in colour. The margins, veins and petioles are sparsely covered in large glandular hairs. Jatropha gossypiifolia is commonly cultivated as an ornamental in tropical or warm arid environments, but its popularity as an ornamental has allowed it to naturalize in many regions outside its native distribution. It is now considered a noxious weed in some of these regions, including parts of Africa and Australia. For a highly detailed account of this species as well as additional images, see the Prota Database’s website: Jatropha gossypiifolia. Belly-ache bush’s common name comes from its toxicity to humans (and other animals) when ingested. The major components responsible are the phytotoxin curcin and purgative oils (aka hell oils), both of which are found concentrated in the seeds. Despite its toxicity, some of the chemicals found in Jatropha gossypiifolia have been found to have medicinal qualities. This species has been used in traditional medicine throughout its native and introduced habitat for the treatment of ailments ranging from fever to cancer. For a highly detailed summary of this species chemical make-up and history of usage, visit the site of the International Programme on Chemical Safety: Jatropha gossypiifolia. This entry would be much more useful if included in the description were growth zone ,use as an indoor plant in zones requiring such,avalability, cutural requierments. Basically I would like to see the data that anyone interested in obtaining & growing this would needd. Amazing photo! Thanks, Anne. Thank you, Bryant, for the write-up. Tom, All of that kind of horticultural information you are interested in is probably very easily available with a few quick googles or a visit to a website devoted to landscape uses of plants. I don’t know where you are located, but sites like the Missouri Botanical Garden’s, NC State’s, Ohio State’s, the University of Florida Extension (IFAS) and numerous others are loaded with information, as are commercial nurseries’ sites like Monrovia and many, many others. (Plant societies, Native Plant societies…it’s endless.) For availability in your area try googling the botanical name of the plant together with the name of your state and a phrase like “1 gallon”. I for one very much enjoy this BPOTD as a bit of “botany,” an exploration of things like plant structure, ethnobotany or ecology that are outside my normal day to day practice. With all due respect and empathy for your other ineterests, I hope Daniel & co. stay focused on what they already do so wonderfully. Thank you Bryant for the write-up, and Anne for the brilliant picture.I am fascinated by trichomes, and the sepals (?) on this plant, with their delicate fringe of large trichomes are just delightful. I would never had seen this if it wasn’t for BPotD – what a wonderful gift this site is, thank you Daniel. Thank you David Sacks for your thoughtful entry too. I have seen trichomes(?) on the open flowers of tricyrtis like what i see above on the bud in the background but have never been able to find any discussion of this feature in tricyrtis. I love everything about this site, especially the people. It was the visual beauty first caught my eye- and I found that you tell us how to make photos! Then I discovered that sometimes you talk to us about the science behind the plants. I was hooked! I appreciate the links to horticultural details, but can always google the plant name. Don’t change a thing. For the sake of justice, I must put some notes on the “pinhão-roxo” potential dangers. Jatropha gossypiifolia, a handsome and curious bush, is rather invasive, both in natural and agricultural systems, and very rich in phorbol, a class of substances that are suspected to induce several kinds of cancers. Aside it, the plant is toxic, and dangerous to children. Chronic toxicity have been found in this species. It is said, in central Brazil, that, when the roots of that plant reach the door of the home, the persons are condemned to slow death; some persons say, still, that the plant is not a good “journey companion” to persons. These are two different ways to say that it must not be planted near home. The plant is recommended as a source of biodiesel (vegetal fuel), what is a risk, due to the phorbol real threat to human health, mainly if the plant is planted in large numbers. Phorbol is known as an environmental contaminant, that remain several years in the soil and in the dust, being ingested, and absorbed, by the lungs. Medicinal uses increase the risks. The species of Pedilanthus, Euphorbia, as Euphorbia tirucalli, and many other Euphorbiaceae, have the same potential dangers. Curvelo, Minas Gerais State, Brazil. Whole the plant is rich of strong colors, mainly of varied vinaceous shades, specially the younger leaves. Several species of Jathopha are very ornamental, very commonly planted in Brazilian gardens, as Jatropha podagrica, Jatropha multifida and Jatropha integerrima, but I would not those plant them near my home. I love those magnificent plants, but I love much more my family. 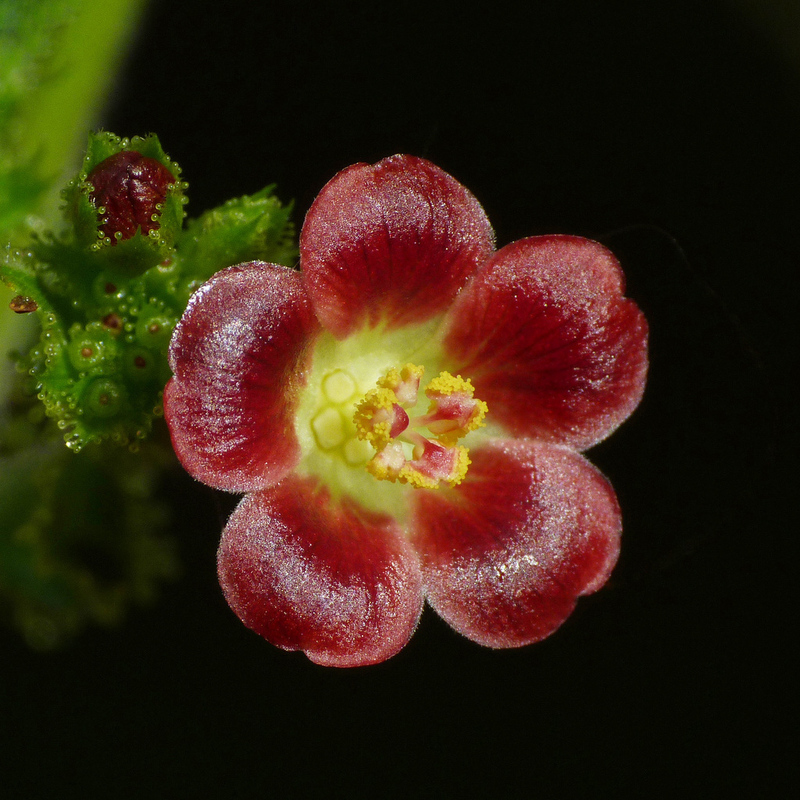 Some efforts are dispended in plant breeding in order to eliminate phorbol from the seeds of Jatropha curcas, but the phorbol content in the whole plants is much more threatening for human health than in the product.